My heart grieves for us. I am sitting by the gate to the underworld, arms crossing my chest, rocking back and forth. Moans escape my throat. Somewhere below me, beauty walks into the dark. Somewhere below me, justice takes off her crown. My favorite character in the Sumerian story of Inanna’s descent into the underworld, is Inanna’s loyal companion, Ninshubur. Ninshubur is the one who waits by the gate for Inanna as she takes the journey that no one is supposed to come back from—the journey into death. The Sumerians saw the planet Venus as their goddess, Inanna. They saw the retrograde journey of this planet as a journey into the realm of death. This lunar cycle is marked by this journey. Venus in Scorpio, already associated with death anyway, stationed retrograde on October 5. Libra, the sign of this lunar cycle, is ruled by Venus. Venus is the focus for this lunation. Venus brings the wisdom for this cycle. Venus guides our magic, our intentions. Who is Venus? For me, this is a gender question. Let me confess. I am less sure that Mysterious Ones, divine ones like Venus, possess gender the way we are taught by our culture to think of gender. So, when I ask who is Venus, I wonder why we have been taught to think about Her as a her. What does the assignment of woman mean to this Being? What does Venus want to teach us about ourselves within and outside gender assignment? So many questions. They seem important at this moment when gender is playing such a large role in current politics and paradigms. Here are things I do know about Venus. Venus is Beauty. Venus is Justice. Venus holds up the mirror of relationship, inviting a softening of individualism. Venus glorifies grace, charm, allure. Venus venerates seduction and the power of the receptive parts of us. How do we invite? How do we consent? The question of consent is important right now, too. Because yes only has power when we have an equally powerful no. Venus as the Mysterious One of the scales, knows about such balance, and demands justice around the violation of this balance. Venus is fierce, too. In Scorpio, Venus shows us their rage and fury when agreements are violated or aren’t even negotiated in the first place. Venus will not put up with this. And Venus is Inanna, choosing to go into death, leaving us to wonder if we have lost her/them forever. Have we lost beauty? Have we lost justice? How do we retrieve them? Can we? As Ninshubar, first we grieve and then we act. Ninshubar refused to give up on her beloved. Ninshubar went round to all the gods until she found help, until someone would agree to make the proper bargain with death. The bargain was made. Inanna was returned. There are no guarantees in this process except that we will not be transformed unless we surrender to death first. Until we recognize what we have lost, and grieved by the gates, nothing will change. How we seek rebirth is up to us. What we do with our grief is the work of this lunar cycle under the influence of Venus retrograde. Venus contacts the two planets of action and disruption during this retrograde (which began before Venus ever turned retrograde). Venus and Mars square each other three times. Venus and Uranus oppose each other three times. Of course, we are frustrated, angry. Inanna is taking with her, the pains we have felt around impotence and destruction. Retrogrades are about reclaiming. What are we meant to reclaim about passion and clarity of action? The squares between Venus and Mars began on September 8. 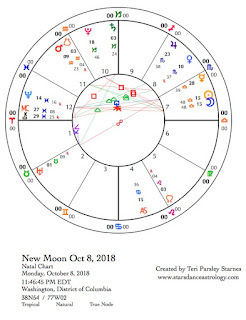 The next one is right after this new Moon on October 10. The final one is on November 9. Sometimes Venus can be blamed for the programming that we shouldn’t rock the boat, that it is ungraceful to be angry. This ongoing square challenges that notion. The opposition with Uranus follows close behind. The planet Uranus speaks to us of change and revolution. Uranus is the wake-up call. Transits to Uranus this lunar cycle will remind us to check in with our authentic selves. Are we truly alive in this moment? What does being awake mean under the mantle of grief and rage felt by so many at this time? This is a real question. Can we break through to new understandings about how to act with purpose when emotions are so high? What feels true to our essential natures? Venus wants this as much as Uranus. Venus opposes Uranus in Taurus (another sign ruled by Venus) Venus opposed Uranus for the first time on September 12. The next two will be October 31 (right before the U.S. midterm elections) and November 30 (after we find out what the elections did or didn’t do). Other important influences concerning Uranus: Mercury will oppose Uranus on October 10. The Sun does it on October 23. These transits reinforce the message of transforming relationship to resource, our bodies, and the Earth (Uranus in Taurus). Uranus will re-enter Aries on the last day of this lunar cycle on November 6. Uranus returns to Taurus on March 6, 2019. If a retrograde is a reclamation, then Uranus returns to Aries to reclaim cardinal fire—perhaps this is the ability to dare, to begin, to leap into the unknown. How will these qualities serve us when Uranus returns to Taurus? This lunar cycle tells a story of paralyzing grief and rage. It offers the question of how we go forward from this place back to purpose and reengagement. Death is the ultimate force of reckoning. This is no time to pretend we can make everything look nice on the surface when so much is rotten underneath. We are meant to reclaim our power. We are meant to recall the powers of Beauty and Justice. Moods darken today. That doesn’t mean it gets worse. The dark can be a comfort too. At the end of Libra, Mercury makes a quincunx aspect to Chiron in Pisces. Receptivity helps us tune in to the messages we need to hear at this time. Dominant voices don’t need our attention. Who do you love? Who is hurting now? With whom can you share your pain? Make these tender connections. 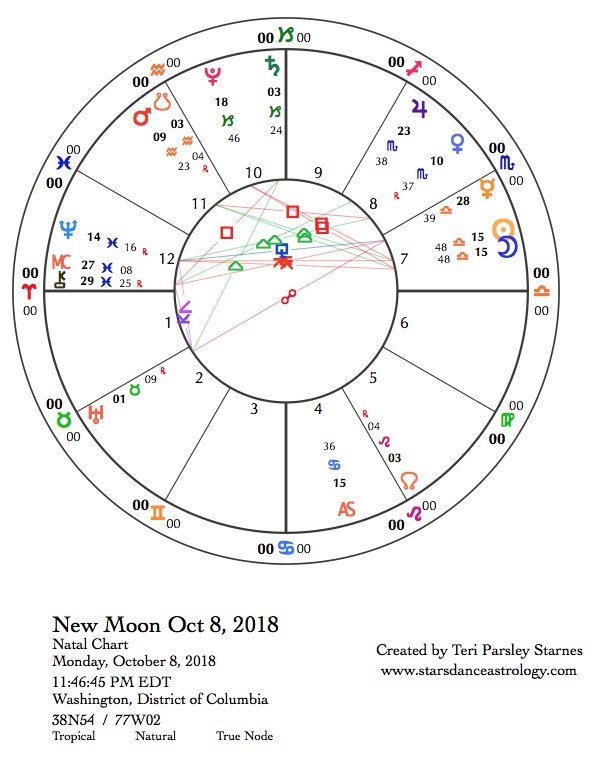 Mercury and the Moon enter Scorpio later today. Perhaps bitter cynicism shows up. Perhaps we entertain a fantasy or two of revenge. Perhaps that is OK. The Moon and Mercury in Scorpio make squares to Uranus in Taurus early in the day (central U.S. time zone). This alone makes for hot tempers. Add to it that retrograding Venus in Scorpio is making a square to Mars in Aquarius, and we are in for backlash. Recently, the U.S. President apologized for how Kavanaugh was treated during his confirmation hearings. We will hear outrageous things. We will be tempted to be outraged too. Perhaps that is just what you need to do. To achieve maximum benefit from these challenging transits, set intention for what you would most like to achieve with your rage. What matters most? Scorpio has a brilliant way of getting to core issues. We can spin our wheels in the same old patterns of behavior or we can break free. Uranus wants this breakthrough to matter too. Mars in the fixed air sign says, “Be smart while being unwilling to put up with the status quo.” Remember your tools. You are brilliant. You are change. What is below the below? We are diving this week into that place—a place that can feel haunted by pain but also a place that can reconnect disparate pieces that have been severed. Healing is in this place, as well as grief and rage. Scorpio influence holds sway. The Moon, with support from Jupiter in Scorpio, reinforces the square aspect between the Sun in Libra and Pluto in Capricorn—a call to deep diving. At the new Moon (in Libra), I set intention to grieve for and reclaim Beauty and Justice. The Sun in Libra reminds me that this grief work is important. How do I bring back the severed pieces of soul? How do I move through my bitterness to reclaim power? What do you need to let go of? What do I need to remember? Tectonic plates are shifting. Even small acknowledgements of the vast underworld below each of us is enough to touch into this power of transformation. These are powerful times. Do not forget yours. The dark of the Moon has passed. Consciously and unconsciously, the seeds of this lunar cycle have met the waiting soil of our souls. The seeds’ hard shells, encasing the germ of life, break open. Roots push down. What resource are your roots encountering? What immediate nourishment do you need to draw up? An entire life cycle awaits. The way the rest of this lunar cycle unfolds, in large part, will be due to what has happened in the past four days. Now, life takes over. A noticeable change in temperament and energy happens today. The Moon moves into optimistic Sagittarius. Like an arrow shooting out into the unknown, we fly free, more curious about what may happen next. Important support arrives today. Mercury in Scorpio makes an encouraging sextile to Saturn in Capricorn. All the deep stuff we’ve been feeling the last week fuels productivity. This is good visioning for the future energy. Especially if we want to lay down the next steps to take to reach the top of our particular mountains. These lunar seeds tremble with anticipation. Dig in. Begin. That arrow that Sagittarius likes to wield, can do a lot of things. It can get to the point. It can release pent up frustration. It can land in new understandings. (Since Sagittarius is mutable fire, I often think of the arrow as tipped with flame.) It can illuminate. It can inspire. What would you like this arrow to do today? Be aware that the Moon in Sagittarius makes a square aspect to Neptune in Pisces. This influence means we may need to be intuitive about where our arrows may land. How do you navigate emotion while aiming for your dream? How do you keep aiming when the way forward isn’t clear? I like to think that the Venus retrograde influence of this lunar cycle just makes everything juicier, even the mundane choices and actions we need to take in our lives. What I mean by juicier is that life feels mythic right now. Bigger than life emotions. Bigger than life realizations about the nature of life are going on below us. And we get to carry on as if they aren’t, but they are. The Moon in Capricorn encourages a marriage between the mythic and the real. This is a very good pairing. What will you make of it? Mercury and Venus meet today in Scorpio. These two have a lot to gossip about. Secrets are being shared. If you are working any magical spells about toxic secrets being revealed, this is a good day to charge that magic. Gossip serves a function. It can be a connector in community if we are careful not to create false intimacy by scapegoating others. How can shared information, concerns, and fears help us know what matters most? How can it help us focus on what and who needs the most tending in our networks? Practice healing gossip today.